Crystal Jun Rock advert (starring D. Bowie). A minor cultural oddity exposed by the all-seeing Internet is how various celebrities get a quick paycheck by doing TV ads in countries where they once assumed their primary fan base wouldn’t see them, touting everything from Polish banks to Japanese beers. Sofia Coppola’s Lost in Translation captures a time when this type of sell-out was more discreet. In early 1980, Bowie did a TV ad for a Japanese shochu manufacturer, Crystal Jun Rock, filming a spot at a Kyoto temple and licensing out an instrumental outtake called “Fuji Moto San” (sometimes incorrectly referred to as “Fuje San Moto”). “The money is a useful thing,” Bowie later said, also noting that he got more airplay via TV ads then he did with radio at the time. While it made sense to cut it from Scary Monsters, where “Japan” would have been an even more anomalous LP closer than “Secret Life of Arabia,” it’s a shame that “Crystal Japan” has been generally forgotten, as it has some of Bowie’s most gorgeous melodies of the period: the first childlike motif that begins at :25, the subsequent “choral” melody and development that follow it, and the resolution, with a rising-and-falling synthesized bass (almost gong-like), and the tiny three-note patterns that appear before the curtain falls. It’s “Warszawa” in miniature. Recorded: Jan 1980?, Mountain Studios?, February 1980, Power Station, NYC. Released as a Japan-only single (RCA SS-3270) in spring 1980 (c/w “Alabama Song”) and then as the B-side of “Up the Hill Backwards” in March 1981. Later included on the Ryko reissue of Scary Monsters and All Saints. Trent Reznor (subconsciously) nicked the melody for Nine Inch Nails’ “A Warm Place” from it (confession to Bowie @2:00 in this interview). 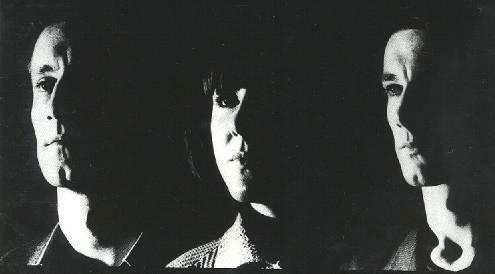 Top: The Young Marble Giants, 1980.